2016 was the year of prediction anarchy, wasn’t it? The polls predicted that Hillary Clinton would be elected President. Wikileaks predicted that she would be arrested based on information they released. Hardly anyone except the voters predicted that the United Kingdom would stop being so European . And who predicted that Springfield Armory would introduce an AR-15 rifle? 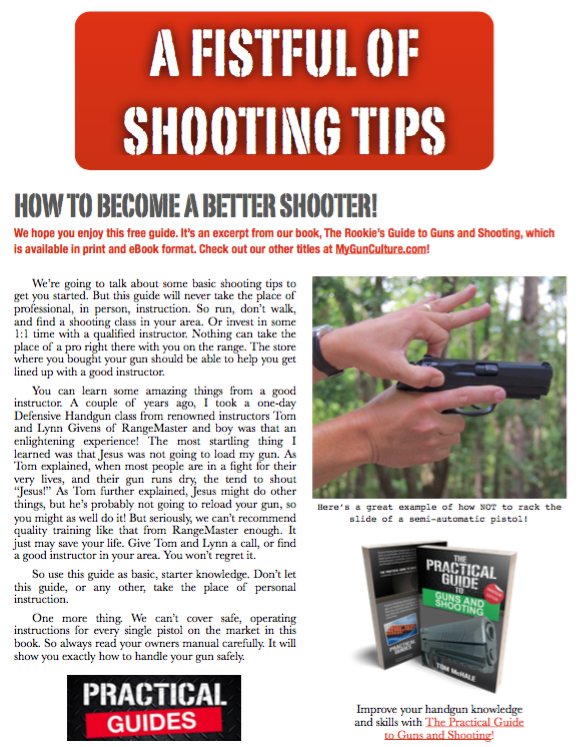 Here are some of the things I see happening during the coming year in the shooting industry. We’ll have enough concealed permit holders to stretch from New York to Honolulu – five times. Right now, not even counting all those citizens legally carrying concealed in permit-less constitutional carry states, we’ve got over 14.5 million concealed carry permit owners. Sure, I could phone this prediction in and add a few percent to that figure, but consider this. More and more states are passing constitutional carry, so permits aren’t required at all. If we do some fancy algebra and carry the one, I think the remaining permit-requiring states will still show substantial growth of the national total. 2016 is looking to be a banner year for gun sales, with the number of background checks (an indicator of sales, not actual sales numbers) in the first 11 months already handily exceeding all of 2015. More gun buyers mean more carry permit applications. In case you’re wondering, according to economist John Lott , 6.06% of the total adult population of the United States has a concealed carry permit. In 10 states, over 10% of the adult population does. Those are big numbers, folks. So how many concealed permit holders will we have on December 31, 2017? I’m betting we break the 17 million number. That’s right, if they hold hands and sing, they’ll stretch over 19,000 miles, enough to go 80% of the way around the world, or from New York to Honolulu five times. There are 11 states plus Puerto Rico (in theory if not reality) that currently allow for permit-less carry, although that number varies depending on how you count some technicalities like open carry versus concealed carry. Four additional states have some modified form of constitutional carry including the ability to carry a gun with a loaded magazine not inserted or outside of city limits. For 2017, Texas looks promising. Open Carry legislation sailed (in relative political terms) through without too much fuss, so an incremental change to add concealed carry seems realistic. Second Amendment friendly folks hold big majorities in the state House and Senate, and the Governor is NRA A-rated. Big pushes are under way in Georgia, Colorado, Indiana, Iowa, Kentucky, Louisiana, and several more. In New Hampshire, Governor-elect Sununu promises to push for an upgrade of the carry laws there which would move the state to true constitutional carry as opposed to the “unloaded” carry law currently in place. Bottom line? Look for another handful of new states returning to pure Second Amendment interpretation. The Hearing Protection Act, which makes the process of buying a silencer the same as buying a gun (no $200 federal tax stamp, onerous paperwork, and ridiculous waiting period), is in the right place at the right time. The name alone keeps it (generally) off the front page of the New York Times and the product in question is not a bullet spraying assault artillery battalion in a box. It legalizes mufflers. Yes, mufflers for guns, but mufflers nonetheless. It’s also payback time for the NRA, American Suppressor Association, and a slew of manufacturers and citizen constituents who helped the Republican party sweep the House, Senate, and White House. If I’ve done my math right, the original Hearing Protection Act was introduced way back in 2015. It’s not surprising that it hasn’t advanced during that time because President Obama was less likely to sign this than taking up Mixed Martial Arts when he retires January 20. Since bills can’t sit for more than two years, it has to be introduced again when Congress resumes its critical job preservation and self-enrichment work in January of 2017. Given the time it takes to move through committee and onto the main floor, I’d guess we won’t see a bouncing baby silencer law until the fall. It should pass the House easily. Yeah, it may face some opposition in the Senate, but I don’t see an official filibuster against this one. Why? I think they’ll save that fight for the National Reciprocity fight, which we’ll talk about next. National Reciprocity will not be signed into law, yet. While the Hearing Protection Act is relatively non-threatening and scary, at least in comparison, the National Reciprocity Act is already causing more major bed wetting and panic attacks than a promise of free bazookas for each child who earns a certificate of participation in little league badminton. If you’ve subjected yourself to scanning recent New York Times headlines, you’ve seen plenty of stories about how National Reciprocity will decrease safety in places like New York, Maryland, Massachusetts, and Connecticut just to name a few. What’s not explained in those articles is how concealed carry has made dozens of other states less dangerous, but hey, who are we to argue when the media chooses to have a mad cow? There are numerous iterations of concealed carry reciprocity floating around the House and Senate, but I’m not sure we’ll see a signed law in 2017, even through the White House and the majority of Congress Critters are warm to the idea. A handful of states will be absolutely apoplectic about this one. They’re starting with the “everything is going to be super dangerous” theme now, but expect that to advance to a states rights fight before too long. Yeah, I know, they want all the other states to adhere to their ideas, but when it comes to this topic, you can count on them forgetting how much they normally want the Feds to rule and throwing a hissy about the federal government trampling on their ability to govern locally. It’ll take more than complaining to stop or delay National Reciprocity, so I expect we’ll see a small gang of Democrat Senators jumping on the filibuster express over this issue. I also expect we’ll see some legal challenges on constitutional grounds from some of the gun hating states. The result? While I really, really hope we can pass this, and I think we will, It may flow into 2018 before all is said and done. Smith & Wesson will get into the fashion business. Smith & Wesson CEO James Debney has made no secret about his plans to diversify the company, and the most recent move proves the point. The holding company will change its name, and stock ticker symbol, to reflect a broader mission under the label American Outdoor Brands, Corp. The company has made some recent non-gun acquisitions, although both Crimson Trace and Battenfeld Technologies are squarely in the shooting industry space. What’s next? I’m guessing the Smith folks might go wide with a company that either is or could easily be, expanded beyond guns and shooting. 5.11 Tactical could be a possibility, and the company is well positioned to expand beyond the military and tactical heritage into more general purpose rugged outdoors space. Or, maybe a play for Realtree or Mossy Oak (Haas Outdoors) would be a clean extension into the hunting market, again with an easy expansion into the general active outdoor enthusiast space. OK, they won’t be doing any runway shows at Fashion Week , but clothing and apparel could be a 2017 acquisition. Those are a few of my guesses, what do you see in your crystal ball for the coming year? As I have posted on many sites, National Reciprocity will not change anything. Sure, your Concealed Carry Permit will be valid in all 50 States, BUT NOT YOUR CARRY GUN AND/OR AMMO. Magazine limits, bans on Hollow Point Ammo, many handguns illegal in some States. Just look at California and the Handgun Roster of legal handguns. I carry a Taurus PT24/7 Pro LS DS 9mm. 17+1 with Federal HydraShock 135gr. 9mm JHP. Not on the list. Illegal in New Jersey, New York, California, Hawaii and probably many other States. National Reciprocity does nothing for me. What is a person supposed to do? Buy a handgun that would legal in whatever State they want to visit? Or go unarmed? I only travel between South Carolina and Ohio (I-77) and every State in between recognizes my Permit and allows Open Carry. Just a point of clarification: the roster of legal handguns in California is a limit on FFLs only. Those are the handguns businesses are legally allowed to sell. That is not a list of handguns you are legally allowed to possess personally. Texas didn’t vote in open carry for everyone, only C.C. permit holders can open carry. However, you can take the C.C. course and tests, pay the fees and THEN open carry. What I call ‘Open Carry Lite’. Its a step in the right direction, no doubt, but you still have to be identified by the state, which to me is against the whole spirit of open carry. If the state regulates and has the ability to deny this right then it’s not the freedom to posesss fire arms as promised in the Bill Of Rights. The whole subject gives me gas!